Step right up to the Washington Sideshow! See the lobbyist do strange things. Go ahead. Don’t be afraid. Ask me about earmarking. Then watch my head spin, my eyes bulge, and listen as I speak in exasperations, convolutions and contradictions. Outside the Beltway earmarking might be a specialty of tattoo artists. Inside the Beltway, and in the public sector among countless State and local officials–and even in the private sector–earmarking is about addressing solving problems and getting business done. It is what you ask of your Senator or Member for your town or company or non-profit. Earmarking, rarely adequately-explained in the media, is usually defined as bacon-brought-home. The water supply project. The library addition. The in-the-bag contract with the Army. The jet fighter the Air Force doesn’t want but your constituents want to build. The genome research grant. The road extension. The claim is that earmarking costs money that otherwise would not be spent and, in any event, should not be spent in this time of record deficits. Others respond that it represents “only” less than 1 percent of the cost of a major funding bill. Defenders of earmarking reach for the Constitutional argument: Congress and Congress alone was given responsibility for making funding decisions. Besides, goes the insulting tag line, why should Congress defer to “faceless,” “unelected” “bureaucrats” to decide what projects to fund or grants to award? Recent congresses have adopted ever tighter rules to improve transparency and to formalize making earmark requests. However in this post-election period we see earmark critics empowered to the point of sending once-proud practitioners to the public confessional from which they emerge chastened and converted to the cause. Okay, enough about Congress. What about your head spinning? Okay. Here goes. Earmarking has gotten out of hand. It’s the self righteous indignation about earmarking that has gotten out of hand. It used to be about bringing home the pork; today the farmyard is emptied of its livestock. But there is an unreasonable demand for purity by tea party adherents and Republican leadership. Yes, but there definitely are bad earmarks and that’s got to stop. But there is nothing bad about helping your district get funds for needed sewer lines. Something needs to be done. Yes, something needs to be done. Okay, okay. So your head can spin. What does this have to do with the MTS? If we’ve learned anything about the developing American marine highway it is that it is developing incrementally and slowly. A few nice-sized steps but no big leaps. I have little doubt that the market will eventually demand greater use of the marine mode for domestic goods movement as the limits of landside capacity reach an economic tipping point and the imperative strengthens to use less fuel and produce fewer emissions. But the question to ask is whether it is wise to wait. In 2007 Congress answered the question…sort of. This year USDOT finally stepped up to implement that new policy and program. In August some projects were designated as eligible for grant funding and others were identified as “initiatives” to be encouraged. The starting gun sounded on the American Marine Highway program…thus also signaling one of very few opportunities to improve the outlook for U.S. flag shipping. There’s much to be done here in Washington. Federal funding is not the be-all and end-all of the marine highway program but it is crucial. Funding is how policy intent is measured in Washington. Is the $7 million the start of a serious effort or just flash-in-the-pan funding? Without an AMH budget for the Maritime Administration it will not have the program and staff resources to do much of anything in the next years. Without funding for AMH grants the Federal program will seem toothless. States and other transportation planners will ignore it. Start-ups may go only a short distance for lack of resources to secure that needed barge or crane. Likewise, the policy provisions signed by President George W. Bush in 2007 are just a toe in the door. The next Congress should look more deeply into how marine highways can contribute to the overall transportation system and then decide what to do about it and the shipyard infrastructure needed to support it. I think there is plenty the legislature and this change-minded administration can do about it. The next year or two will be a critical period that will decide if the new marine highway policy is to be taken seriously. Grant funding in FY 2011, commencing October 1, is unlikely, but it need not be a serious blow to the marine highway effort. For starters, we need to work to secure funding in the FY2012 budget and strengthen interest among policy makers. Obama Jobs Initiative: Meaning in Missing Words? Additional investment in highways, transit, rail, aviation and water. The President is calling for new investments in a wide range of infrastructure, designed to get out the door as quickly as possible while continuing a sustained effort at creating jobs and improving America’s productivity. Support for merit-based infrastructure investment that leverages federal dollars. The Administration supports financing infrastructure investments in new ways, allowing projects to be selected on merit and leveraging money with a combination of grants and loans as was done through the Recovery Act’s TIGER program. The second paragraph is a reference to the over-subscribed TIGER grant program for which a broad range of transportation projects are eligible and awardees will be announced no later than February. The administration has shown an affinity for “merit-based” grants (as opposed to congressional earmarks and formula funding). USDOT loves it because it puts the Secretary in the position to judge what projects are worth funding and to apply White House principles such as emission reduction. With so little in the way of detail we might infer from the first paragraph that the Marine Transportation System may not be as much as part of the next jobs bill as it was in ARRA signed in February. Does the Obama administration include port or marine transportation as eligible for job stimulus funding? Especially for the “out the door” quickly category? Certainly connecting roads and rail are valuable elements of the MTS but when the president’s proposal for infrastructure funding uses the term “water” it may not mean maritime. I think it means water and sewer infrastructure, which would appeal greatly to capital starved municipal governments but do little for marine highway and other MTS infrastructure needs. Prior references by Congress and the administration to funding maritime related projects as part of ARRA used the word “port“ along with rail, highway and transit projects. No mention of port or maritime in the White House statement or the president’s remarks at the Brookings Institution today. That said, port/maritime projects were eligible for TIGER grants, which the White House appears to want to continue. But almost by definition TIGER grant money doesn’t flow in a matter of couple months. The first grant announcements won’t be made until close to a year after the funds were appropriated by Congress in February 2009. Indeed, I’m told that White House officials said after the president’s remarks that some part of the infrastructure element of the s announcement today may not be intended to pour money into the system over the short term. The White released an outline today. The administration and Congress will put flesh on the bones and maybe once the House and Senate take up legislation early next year ports and marine transportation, including capital needs for marine highway development, will be eligible. In 2007 Congress approved marine highways as a new policy direction in a measure signed into law by President George W. Bush. The Secretary of Transportation “shall designate short sea transportation routes as extensions of the surface transportation system…” and is authorized to “designate” short sea transportation projects. Yesterday President Barack Obama signed a bill containing an addition to the policy and program. “The Secretary shall establish and implement a short sea transportation grant program to implement projects or components” of a designated project. Originally sponsored by Senator Frank Lautenberg (D-NJ) the grant provision was part of a Maritime Administration Authorization Act, subsequently folded into a Defense Department Authorization bill (see title XXXV) that went to the White House. This is a welcome addition to the still new policy initiative to increase marine highway use in the United States. It is a modest but important enhancement of the 2007 law. Money gives meaning to policy. Even if it is just $15 million, the amount that the Administration is prepared to spend if Congress were to appropriate it. (The Senate version of the still unresolved DOT appropriations bill contains funding.) Indeed the Maritime Administration budget plan includes $15 million for each of the next couple of years. I’m not sure if this is a troubling sign but Sally Fields comes to mind when I think of TIGER grants. There were some rules of course, but none of the earmarked projects Congress is so fond of designating to the fullest extent of available funds. In the months that followed enactment of the $750 Bn stimulus package–some $48 Bn of which was allocated to USDOT for near term implementation–Secretary Ray LaHood told port officials and others involved in the MTS that port project applications would be welcomed for TIGER grants. He told the D.C. Propeller Club audience in May that the maritime sector has been neglected and TIGER grants were an opportunity. The ports took to heart the Secretary’s encouragement. He really wanted them to apply for grants and apply they did. Ninety-five applications were submitted for port related projects totaling $3.3 Bn. 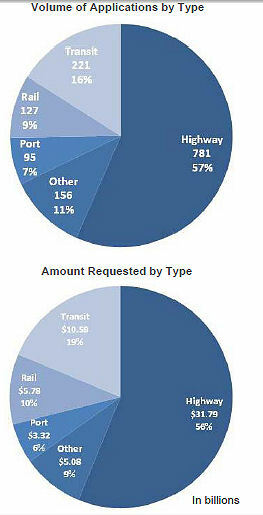 Certainly the smallest of the modal slices on the pie chart, but not an overwhelming difference when compared to rail. At risk of speaking too soon and jinxing the whole thing… A toast to Congress! Well, yes, nowadays we do set low the bar for achievement in Washington. But that is not to diminish the significance of a job completed. Just a few decades ago our Federal government started the fiscal year with enacted appropriations measures–one produced by each of the appropriations subcommittees. But that is a distant memory. Instead Continuing Resolutions (CR) by which Congress gives itself more time to finish bills and ensure government doesn’t grind to a halt now are predictable fixtures in appropriations sausage-making. Same for “omnibus” spending measures into which congresses loads all incomplete funding bills as a last, exhausted effort to get the job done. What’s the big deal about meeting the fiscal deadline? Well, besides clearing the legislative calendar for other pressing issues, there is the matter of how well government functions and the ripple effect on lower levels of government and the entities whose programs, projects, and budgets depend on that Federal money and its timing. In the case of the E&W bill, Corps of Engineers commercial navigation, flood control and other projects involve public agency partners and private contractors. If the Corps doesn’t have a clear funding signal from Congress contracts and other work are delayed. If it is a dredging project, factor in whether the project is in a region where the construction season is limited by weather, and if there are additional calendar restrictions based on aquatic critters mating habits, etc. There are many more practical considerations, of course. The end results are heightened costs and delayed benefits for all involved. In the past seven years the E&W bill was completed by the October 1st deadline zero times. It was delayed anywhere from one to six months. In FY 2007 Congress just gave up and adopted a full year CR, with all its attending disruptions to projects and programs. I. Investing for the future….